By the time you read this, the trade deadline will have come and gone, and it will have passed without any new movement for the Knicks. After a chaotic, dramatic Wednesday that saw Mike D'Antoni resign when his suggestion that Carmelo Anthony be traded was denied, New York will cross the deadline quietly for the first time in a few years. Carmelo Anthony, despite yesterday's rumors, is not going anywhere. Toney Douglas, who is out of the rotation and had his name tossed around a bit, will remain a Knick. James Dolan even gave the team a speech last night (oh, to be a fly on the wall) affirming that this team is THE team for the foreseeable future. The Nets had a livelier deadline. After months of dancing around Dwight Howard, New Jersey was disappointed to learn that Howard waived his early termination option and will stay under contract with the Magic for another year. Thus, after management and the entire Nets roster spent quite a while bracing for a massive trade, there was no deal to be done. The Nets did, however, make one fairly sizable move. The goal now is to keep Deron Williams around with or without Howard, and New Jersey made a step in that direction. 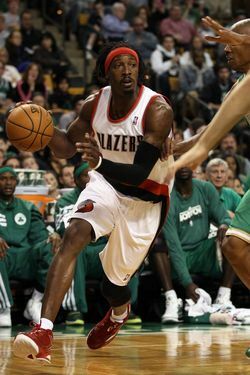 They dealt Mehmet Okur, Shawne Williams, and a top-three protected first-round pick to the Blazers in exchange for Gerald Wallace. For the Blazers, it was a simple matter of jettisoning active talent for a pick and cash savings. As Knicks fans saw last night, they're pretty out of it and ready to detonate and start from scratch. It's a more interesting move for the Nets. That pick, unless they manage a big season-ending run, is going to fall in the lottery (but unlikely to be a top-three selection), but they've evidently decided to sacrifice some of that promise for a living, breathing body. And indeed, Wallace is a terrific player who contributes on both ends of the floor and might help convince Williams to stick around next season. Hell, Wallace and a healthy Brook Lopez might even help New Jersey make a sneaky run to the playoffs. It's a risk — that pick could end up being extremely valuable in a pretty strong draft class — but perhaps the best the Nets could do to provide Williams with winning company. So, the Knicks are the same Knicks they were yesterday, albeit with a new coaching search in gear and an interim guy in charge. The Nets ended up with a pretty big letdown after courting Howard for quite some time, but still managed to make a move. While New York hopes to just achieve success with the core that's in place, New Jersey still has some space to fill (and some assets to keep) as they move to Brooklyn and hope to become contenders.